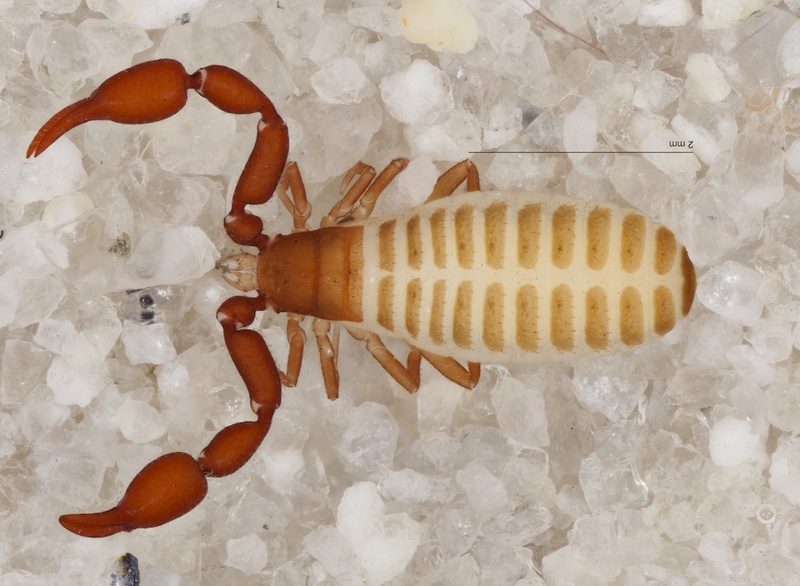 Sorry, arachnophobes, but two new species of ‘pseudoscorpion’ are officially on the books. The newly-discovered creatures are completely harmless to humans, and were discovered in a small cave in the Grand Canyon’s northern rim. The work was completed by Mark Harvey of the Western Australian Museum and J. Judson Wynne of Northern Arizona University. The two species were described in the Journal of Arachnology. One way pseudoscorpions differ from true scorpions is that they do not have a segmented stinger tail capable of injecting prey or predators with venom. Instead, their abdomen is rounded off. Pseudoscorpions do have pincers that they use to eat things like moth larvae, mites, and book lice, which is actually a fairly helpful service to humans. The new species have been named Hesperochernes bradybaughi and Tuberochernes cohni, respectively. These small arachnids are roughly three millimeters in length. They are also troglomorphic, meaning they have adapted to life in a dark cave and no longer have eyes. The species also have legs that are thinner and more slender than their non-cave-dwelling counterparts in order to better navigate their terrain. The specimens were collected from the cave between 2005 and 2007, and were not found in any other cave in the area. In order to confidently state that H. bradybaughi and T. cohni were indeed novel species, taxonomic analysis was completed to ensure that they did not match anything currently known in the scientific literature. At first glance, the two species look quite similar to one another. However, there are distinct differences that warrant the declaration of a new species. H. bradybaughi was named after Jeff Bradybaugh, who once served as superintendent of Grand Canyon-Parashant National Monument. Bradybaugh has been with the National Park Service for over 30 years and is an advocate of cave exploration and conservation of the organisms found within. Tuberochernes cohni was named in memory of entomologist Ted Cohn, who passed away in 2013 at age 82. Cohn discovered a new genus of cricket from the same cave where the new pseudoscorpion species were found. In addition to the discoveries of H. bradybaughi and T. cohni, the team’s investigation around the Grand Canyon-Parashant National Monument also found that the range of another pseudoscorpion, Larca cavicola, is larger than previously believed. Additionally, it was discovered that the genus Archeolarca is actually part of Larca. This resulted in four species from the now-defunct Archeolarca genus being renamed to reflect their correct identity. If you’re planning a trip to the Grand Canyon soon, don’t plan on getting to see these little guys in person. In order to protect the newly-discovered species, the authors of the paper agree with previous recommendations to prohibit recreational use of the cave.